This is a guest post by Catherine Daugherty of the blog My Daily Bread Body and Soul. Are you planning recipes for a summer family reunion, a holiday event at home or even a larger Christian event? Yes? Well then, I have some wonderful tried-and-true options for you! 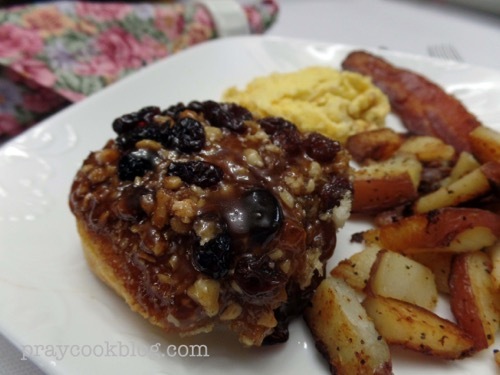 I absolutely love spending time in the kitchen and creating “somethin’ lovin’ from the oven!” But even I can get a bit overwhelmed when planning food for a large group. That is why I recommend three simple steps before actually preparing food for a big event. This may seem like a no-brainer but cooking for a group isn’t a time to bring out the gourmet sauces and show off your culinary expertise. Retreat or holiday planning is the time to prepare dishes that are simple in structure and allows you time for fellowship while enjoying the meal too! 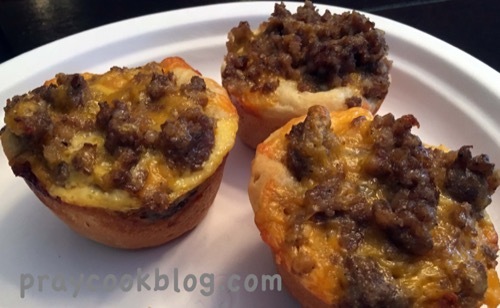 These Sausage and Cheese Biscuit Cups are fun to make but even more so, they are delicious to eat! Often, family members and retreat-goers want to help with preparations. This recipe allows for family involvement and many helping hands to make it go together fast and easy. After just one bite, friends and family will cheer on the cooks for making these scrumptious breakfast biscuits! I especially like the versatility because they can be made with or without meat, using various kinds of cheese, and the ease of canned biscuit dough. These biscuits do not require a plate or fork so even the little ones can help themselves to this breakfast treat. Choose recipes that allow for part or all of the preparation work to be done ahead of time. The more you prepare for the event, the more you will enjoy family and friends during the retreat or reunion. 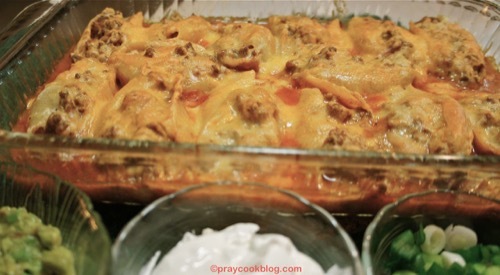 Mexican Stuffed Shells are a tasty entrée that can be done completely ahead of time, frozen and then just heated up when ready to serve. 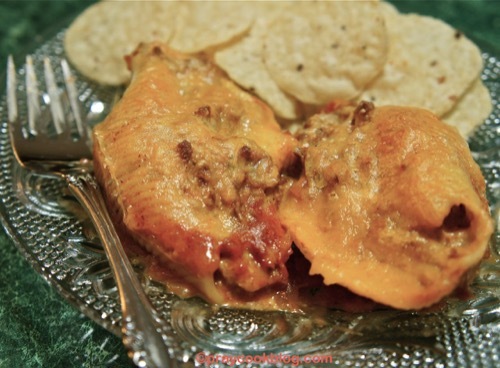 I love this recipe because a few tortilla chips and a green salad make for a complete meal! Adults and kids alike will enjoy the Mexican flavors in a pasta shell. We hold a family reunion every two years. Over the past five gatherings, the age range has been from two months to 85-years-old! Feeding this large family of 40+ can be a challenge. However, we keep it simple, serve food that can be prepared ahead of time and most importantly we know our group. For instance, knowing ahead of time who is gluten-free or vegetarian helps make sure we have plenty of fresh fruit and vegetables on hand. If a family member or retreat goer has a food allergy, calling them ahead of time to let them know what you are preparing will save trouble at the mealtime. Knowing ahead of time, will allow necessary changes to accommodate your family member with an allergy. 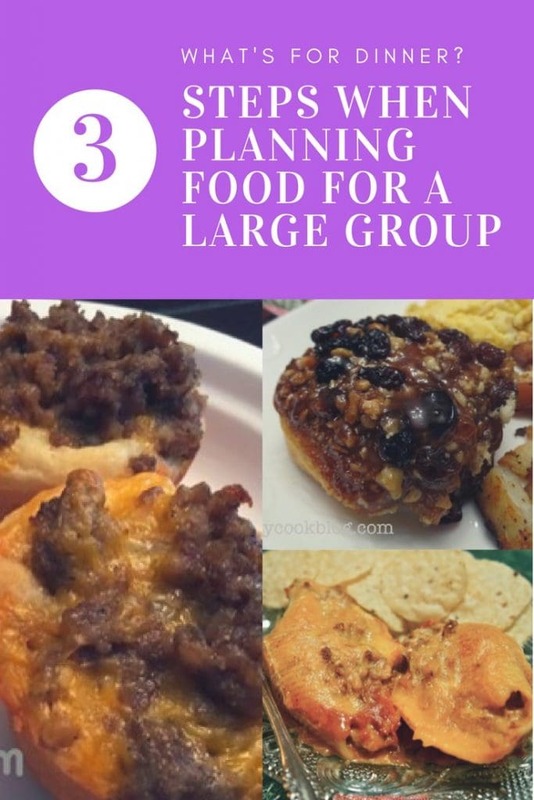 These are just 3 simple pre-planning steps that will make a big difference at mealtime when planning food for a large group. Before I sign off today, I want to include one of my favorite recipes, which was given to me while I was at Beersheba Springs Assembly in Middle Tennessee. As I approached the breakfast bar one morning my eye caught a huge tray that looked like cinnamon rolls or some kind of gooey delight. I soon discovered Sticky Biscuits are a morning staple at Beersheba, and the cook was more than willing to give me the recipe. In fact, when I approached the kitchen window to ask about the gooey, sweet, yummy biscuits, the cook smiled, moved to a drawer where she extracted the recipe and handed it to me. She keeps multiple copies on hand because apparently I wasn’t the first or the last to ask for the recipe! I love these biscuits because they go together fast and easy. 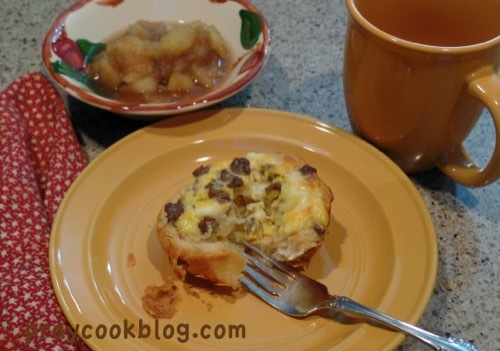 The recipe is easily adjustable for serving at home or for a group of hearty retreat goers! I hope you enjoy them as much as we do. Preheat oven. 300 degrees F. for a convection oven, or 350 degrees F. for a standard oven. Melt butter in medium saucepan over low heat. Add brown sugar, syrup, cinnamon, and fruit. Heat until sugar dissolves. (Do not boil) Remove from heat. 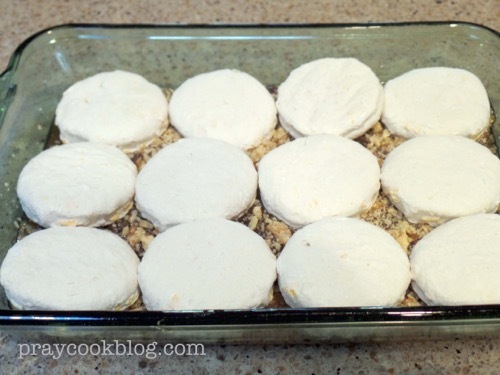 Spread mixture evenly in bottom of a greased 9″ x 13″ baking dish. Sprinkle walnuts evenly over caramel mixture. Arrange biscuits over the mixture. Bake for 25 to 28 minutes in a convection oven and 30 to 35 minutes in a standard oven, or until biscuits are brown and bubbly. Remove from oven and immediately turn pan upside down onto a parchment-lined serving plate. Let stand 1 minute and serve warm. Original recipe from General Mills. Other combinations of dried fruits and nuts may be used such as pecans. This recipe can easily be doubled or tripled. With summer just around the corner now is the time to start planning the details for your family reunion or holiday get-together! Having your event at a retreat center like the Oasis Christian Center is the best of all worlds because they take care of the food and all the details for you. This winter I attended a wonderful leadership retreat at Oasis. We were totally spoiled by their staff, the accommodations and the wonderful food. If doing your own thing isn’t in your wheelhouse – talk to Andy and let them spoil you too! Catherine Daugherty is Creator and Co-author of the blog My Daily Bread Body and Soul at www.praycookblog.com. She is a wife, mother, and grandmother and honed her skill and love of cooking while cooking for family and friends! She is an Area Director for Community Bible Study and follower of Jesus Christ. Catherine exclaims, “I am an ordinary woman with an extraordinary God!” Her true joy comes from sharing the Word of God and how it has transformed her life. Praycookblog came about from her desire to share that which is important to her — wonderful food recipes for the body and scriptures for the soul.